Vianini Industria is a construction manufacturing company based in Rome. Vianini Industria (not to be confused with Vianini Lavorni) is part of the Caltagirone family of companies as I discussed in this post. The biggest project Vianini Industria is involved in is construction of the new Line C of the Rome metro. The Rome metro's 17 mile Line C extension is the first metro line which will extend beyond the city proper. The line was originally supposed to be opened in 2011, but there have been work stopages due to finding antiquities along the line that have put the timing of the opening into question. The Line C expansion's total cost is expected to be around €4.3b, of which Vianini Industria plays a small part. In 2010 Vianini Industria had €12m in revenue down from €18m in 2009, the Line C expansion is billed as a €15m project with an extra €7m extension possible at the client's choice. The depressed value of Vianini seems to be due to decreasing revenues and a halting of the Line C project which is accounts for most of their revenues. Vianini Industria also owns equity interests in other companies, this isn't uncommon for a company in the Caltagirone family. I'm going to take the value of these equity interests at face value, it doesn't seem like they're publicly traded so it's unclear if they're marked accurately. The company has a contract in 2011 to provide €15m of railroad sleepers (railroad ties to Americans). The company pays a two eurocent dividend which amounts to about a 1.4% yield. Since the company is an operating and profitable business I put together a small worksheet showing some key income statement stats. 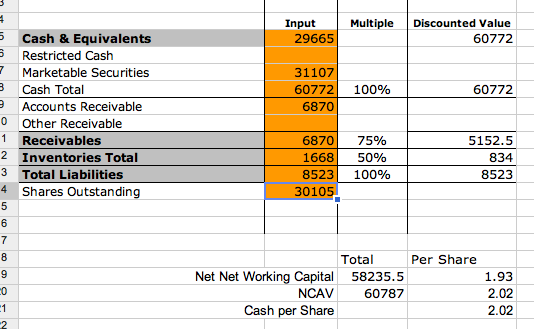 As a note Vianini Industria doesn't distribute a cash flow statement with it's reports, it would be very easy to build one based off the income statement and balance sheet, but I didn't undertake that for this issue. A few things stick out, the first is that income from equity investments is a very large part of their net income each year. The second is earnings are very streaky, which is why the market isn't placing much value on them. While the company is trading cheap to assets it's expensive when looking at the earnings of the business, with a P/E of 35 and a EV/EBITDA of 18. While this is a cheap asset play I'm not sure if there is enough of a margin of safety for me to invest. My main concern is that the business on it's own isn't strong enough and will eat into the capital cushion over time. My other concern is that most of the companies earnings come from it's equity investments, as I have mentioned in my last post this is common in this family of companies, but I don't think investing in Vianini Industria is the best way to play it. Disclosure: I do not hold a position in any issue mentioned in this post. Thanks for the comment, from what you've said I've decided to take another look at the stock. It seems that with the Euro crisis what is cheap has gotten cheaper, and in the case of VIN it's now trading below cash value. Thanks again, I might be adding this to the portfolio soon.